Smith faculty member Blair Robertson presents at the Business Forecast Luncheon 2017. Kingston, ON — Uncertainty from the U.S. election and a rise in anti-trade rhetoric were cited as reasons for the slow export growth, reduced business investments and increased inflation we can expect for Canada in 2017, according to Smith School of Business experts. 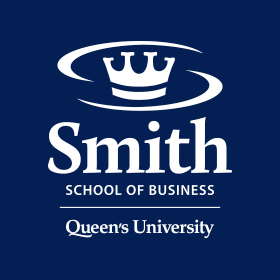 Evan Dudley, finance professor at Smith, made his predictions for the 2017 Canadian economy at the annual Queen’s Smith Business Forecast Luncheon held last week in Kingston. Slow export growth, reduced business investments, and trade uncertainty will constrain output for Canada. The coming year may see marginal growth in Canada’s real GDP, up 1.75 percent from 1.40 percent in 2016. As well, persistent low oil prices and the difference in monetary policies between the U.S. and Canada will keep the value of the loonie down, with the Canada/U.S. exchange rate holding at $0.75 USD, Dudley predicted. Trade restrictions and expansionary fiscal policy on both sides of the border will push prices higher in the near term, with inflation expected to rise to 1.75 percent from 1.5 percent in 2016. The Canadian unemployment rate will remain around 7 percent due to uncertainty about U.S. economic policies under the Trump administration and low business spending in Canada. Dudley’s forecast was not all was not doom and gloom, however, with strong growth projected for Kingston’s local economy. The event closed with a panel discussion on “Creating the Conditions for Local Economic Growth,” moderated by Smith School of Business marketing professor, Ken Wong. Panel members included City of Kingston Mayor Bryan Paterson and Councillor Laura Turner. Wong emphasized the need to “broaden the tax base, foster more population growth, and, most of all, increase private sector investment.” Councillor Turner spoke to the city’s strengths as a tourist destination, noting the benefits of the low Canadian dollar in attracting U.S. visitors. Dudley shared the Mayor’s optimism for Kingston looking forward, citing two expansion projects – Providence Care ($300M) and the municipal airport ($16M) – and the new Dunin-Deshpande Innovation Centre at Queen’s, as initiatives that will help spark growth in the city. In addition to the forecast and panel discussion, attendees were treated to a non-traditional take on investment strategy from Smith finance professor Blair Robertson and a brief history of the forecast luncheon from the event’s founder Merv Daub, Smith professor emeritus. Daub established the luncheon 35 years ago to forge a connection between Queen’s business school and the greater Kingston business community.